Qualifying for the United States Grand Prix at Circuit of the Americas has been postponed until race day due to unrelenting rain. The showers, that also caused the cancellation of practice 2 yesterday, have come from Hurricane Patricia in nearby Mexico. Practice 3 took place earlier in the day on Saturday, with Lewis Hamilton and the rest of the field performing brilliantly to keep their cars clean; almost in the case of Nico Rosberg who spun off track and broke his front wing. Lewis Hamilton topped the session with a time just under 2 minutes long, but the rain worsened and the delays to qualifying soon began. As the session was put back further and further, the teams and drivers searched for new ways to entertain the dedicated fans at the circuit; some of which having not been allowed in to see the only on-track action of the day. 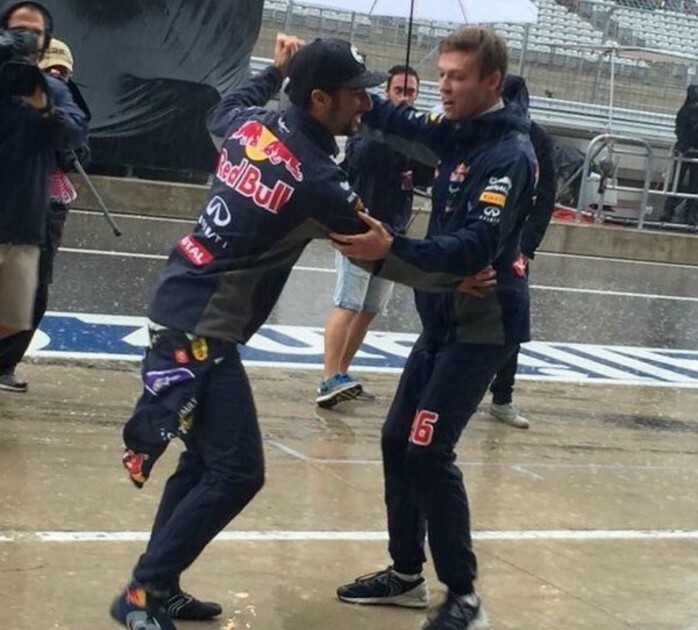 Some drivers waved to the fans from the pit-wall, with others dancing with each other in the case of Red Bull team-mates Daniel Ricciardo and Daniil Kvyat. In the end, it took until just over 2 hours after the original starting time for the session before the FIA announced that qualifying would be held on Sunday morning before the race. Rain is expected for tomorrow, but it is set to be slightly better conditions. Nevertheless, there is a chance that tomorrow’s qualifying and race could also be affected as we have seen today. Qualifying is now scheduled for 9:00am local time or 2:00pm in the UK.